Secret Song Designs: Where have I been keeping myself? It's been a long while since I've worked on anything new when it comes to beadwork. Back in December while I was doing some cross training for the half marathon I ran in January I started to feel some sharp pain in my wrist when I would do a push up. I figured I'd hurt the muscles a bit and if I just laid off it would be fine. As I am sure you can imagine it really wasn't a hardship to not do any more pushups at the time. For a couple of months everything seemed to be ok, but then the pain in my right wrist started to get worse. After a couple of doctor's visits and an x-ray that revealed nothing the doctor decided it was tendonitis an sent me for physical therapy in April. I've spent a long summer of PT and the wrist is now nearly all better (plus I have the best upper body strength I've had in years!). I can't speak highly enough of how wonderful my therapy experience has been. I didn't think it would really help or fix the problem, but though the process is slow, I haven't felt real pain in months. It has meant that beading took a bit of a back seat as I was trying to avoid doing too much handwork. 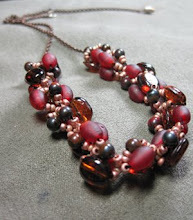 However, now that I am feeling better, I though I'd start by participating in Lori Anderson's Bead Soup Blog Party. A few weeks back I got this beautiful assortment of beads from bead party partner Tammy Powley. I'm excited to show you next week what I've come up with! In the meantime you can check out the other blog project I started - Disney Diversions! Bannerizer makes it easy for you to promote ClickBank products using banners, simply go to Bannerizer, and get the banner codes for your selected ClickBank products or use the Universal ClickBank Banner Rotator Tool to promote all of the available ClickBank products.